Regine May, expert on Apuleius, focuses upon what it is about humans becoming animals that attracts storytellers and to what extent today’s stories differ from those of the Romans in respect of their narratological choices, narrative perspective and psychological descriptions of the transformed humans. The talk will be in the Leeds Story Gallery on the second floor (on the left inside the door on the far side of the Arena Gallery if you come up the stairs; the door on the left from the lifts). 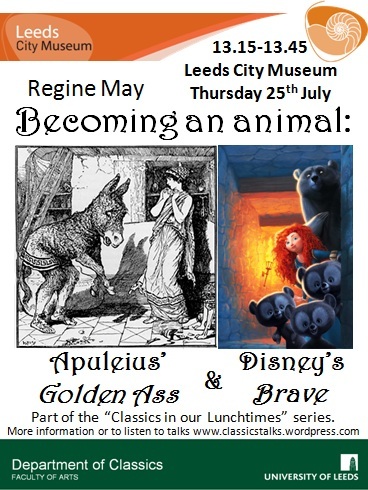 For the precise location of the talk, please follow the poster trail in the Leeds City Museum on the day, or ask for directions at the entrance.